This Lifeguard-Pro statement of Terms & Conditions of Sales is publicly published and appropriately located on Lifeguard-Pro.org. The terms and conditions of sale set forth on this page are legally binding and strictly govern the terms and conditions of all purchases from Lifeguard-Pro, Lifeguard-Pro.org, its employees, authorized representatives, authorized service providers, and authorized agents. As a buyer, it is your responsibility to understand the terms and conditions of sale of the good or service you are considering before you purchase it. Course Descriptions. The definition of all certification courses sold by Lifeguard-Pro, its employees, contractors, affiliates, authorized service representatives, instructors, or agents are published on the Lifeguard-Pro SELECT YOUR COURSE webpage; and, all purchases of these certification courses from Lifeguard-Pro are subject to these certification course definitions published on the Lifeguard-Pro SELECT YOUR COURSE webpage. Type of Good. The Lifeguard-Pro Home-Study Course is a non-tangible good (digital academic testing program) offered only online. Delivery. The Home-Study Course, and all copyrighted, proprietary and valuable materials contained therein are deemed delivered by Lifeguard-Pro to the buyer once Lifeguard-Pro emails or otherwise provides the buyer with the buyer's purchased Username & Password to access the contents of the Home-Study Course. Irrevocable Sale. Once the buyer uses their purchased Username & Password to login to Lifeguard-Pro to access the Lifeguard-Pro Home-Study Course to view, use or access the Home-Study Course or any of the contained copyrighted, proprietary or valuable materials contained therein, the buyer is no longer entitled to any refund from Lifeguard-Pro. No refund can be issued because copyrighted, proprietary and valuable materials are held to market value and worth. Once the buyer has read, viewed, used or accessed the copyrighted, proprietary and/or valuable materials contained in the Home-Study Course, Lifeguard-Pro cannot reclaim that value it provided to the buyer. Consequently, Lifeguard cannot issue any refunds to the buyer once the buyer logs into the Lifeguard-Pro Home-Study Course using their purchased Username & Password. Possible Refund Exceptions. We realize that exceptional circumstance can take place with regard to the character of the product we supply. Therefore, we will consider granting refunds in the following instances. Non-Delivery of the Product: Due to some postal mailing or email issues of your e-mail service provider or your own mail server you might not successfully receive a physical delivery or e-mail delivery from us. In this case, you must contact us within 3 calendar days from the date of purchase or postal mail delivery, so that we can provide you with assistance. Claims for non-delivery must be submitted in writing to info@Lifeguard-Pro.org within 3 calendar days from the date of purchase or postal mail delivery. Otherwise the product will be considered to have been successfully physically delivered and/or electronically delivered. Technical Malfunction: It is possible that you may experience technical malfunctions inside the Lifeguard-Pro Home-Study Course; such as problems associated with downloading files, opening files, saving files, viewing materials, or operating functions. If you experience one of these technical malfunctions within the Lifeguard-Pro Home-Study Course, you must submit your claim within 3 days to our Technical Support Department at info@Lifeguard-Pro.org, so that we can cure the malfunction for you. 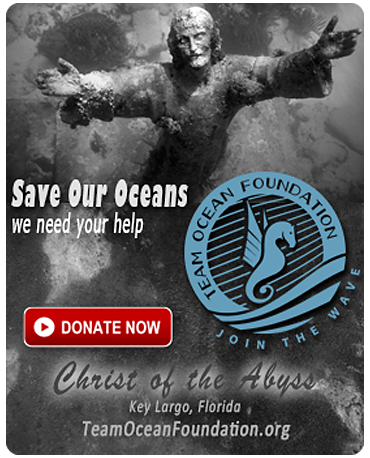 If you do not contact us within 3 days of your purchase, you agree that we may construe your silence as proof that you have successfully downloaded, opened, saved, and operated all files and functions to which you are entitled pursuant to your purchase of the Lifeguard-Pro Home-Study Course; as such, you will have no further right of redress or refund for a technical malfunction issue. Failure to request assistance from our Technical Support Department (info@Lifeguard-Pro.org) for technical malfunction issues within 3 calendar days after purchase will result in a refund and exchange decline. Major Product Defects: Although all the products are thoroughly tested before release, unexpected errors may occur. Such issues must be submitted to our Technical Support Department at info@Lifeguard-Pro.org for our Technical Support Department to review and confirm that the product delivered is defective. We reserve the right to rectify the error or defect by fixing or replacing the defective product within 7 calendar days after the customer has notified us of the defect in writing. If any product defect is confirmed by our Technical Support Department, and we fail to correct it within 7 calendar days from the date of the initial complaint letter provided by a customer, the refund will be issued to the customer in full. Alternatively, at customer’s request, Lifeguard-Pro will replace the product with a less or similar value product. Be advised that temporary remote access to your server or computer may be requested by our technicians to identify and fix the possible issues with our products on your server and/or computer. Failure to provide such access within 3 calendar days of our request may result in a delayed resolution of the issue. Refusal to provide access to your sever or computer for 7 calendar days after our request will result in your inability to qualify for a refund. Product Not-as-Described: Such issues must be submitted in writing to our Technical Support Department (info@Lifeguard-Pro.org) within 3 calendar days from the date of the purchase or postal mail delivery. Customer must provide clear and convincing evidence proving that the purchased course is not as it is described in the course description published on this website. Complaints which are based merely on the customer’s false expectations or wishes will not be not appropriate cause for a refund. Course descriptions are conveniently available for customer review on this website. The customer is required to thoroughly review a course's written description prior to purchasing the course, that course description details what the course includes, does not include, and requires; as well as, the course price, and limitations of the course certification. Please keep in mind, we are accountable and responsible for delivering to the customer only what is included in the Course Description. View our course descriptions on our page entitled >> Select Your Course. 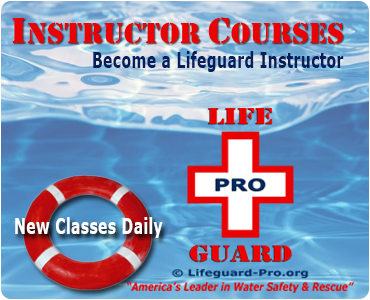 In-Person Training Not Included: Lifeguard-Pro provides only the online Home-Study Course, associated record-keeping, and issuance of certification cards to candiates who prove that they have satisfied all course requirements. Lifeguard-Pro does not provide any In-Person Training. All course required In-Person Training is offered by independent, third-party, authorized service providers (Instructors). 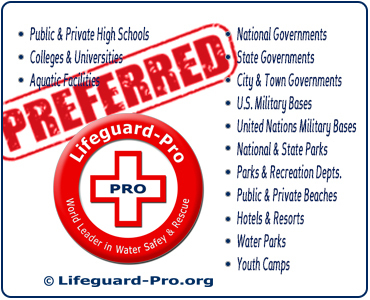 Lifeguard-Pro does not endorse, recommend, employ, contract or control any of these independent, third-party providers. Lifeguard-Pro is in no way responsible for the actions or representations of any of these third-party providers. Buyer agrees to hold Lifeguard-Pro, its employees, contractors, and authorized representatives legally harmless from any actions or representations made by any of these independent, third-party, authorized service providers (Instructors). Failure of any of these third-party providers to deliver products and/or services in a satisfactory fashion will not entitle a Lifeguard-Pro customer to any refund of the Home-Study Course. Lifeguard-Pro is not responsible for providing any course required In-Person Training to the buyer. Lifeguard-Pro is only responsible for providing the online Home-Study Course to the customer, which is the only product that a customer can buy from Lifeguard-Pro. Incompatible Software or Hardware: Lifeguard-Pro does not bear any responsibility and therefore will not grant any refund, return or exchange requests based on incompatibility of our products with the buyer's computer, tablet or cellphone. Buyer's might install some third-party software (plug-ins, add-ons, modules, search engines, scripts, extensions, firewalls, anti-virus programs, less popular browsers, etc) which can interfere with the operation of the Lifeguard-Pro Home-Study Course. Our Home-Study Course is designed to function properly on Apple desktop/laptop computers and Microsoft desktop/laptop using as an internet browser, Chrome, Firefox or Internet Explorer. We do not guarantee that our Home-Study Course is fully compatible with any other third-party programs, software or computers, and we do not provide support for third-party applications or hardware. However, as a courtesy, if you have a hardware or software problem accessing your purchased Lifeguard-Pro Home-Study Course, you may contact our Technical Support Department (info@Lifeguard-Pro.org) for assistance; but, their assistance on third-party software or hardware issues is purely a courtesy and provided with no guarantees. Right to Cure. The customer agrees to email all customer product complaints to our Technical Support Department at info@Lifeguard-Pro.org before initiating any chargeback, and afford Lifeguard-Pro 14 calendar days to repair or replace the product. To provide expeditious product delivery, Lifeguard-Pro may deliver the repaired or replaced product to the customer via email attachment or valid download link. Our Technical Support Department is always eager to assist you and deliver professional support in a timely manner. Type of Good. 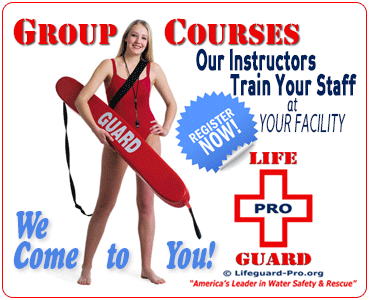 The Lifeguard-Pro In-Person Training Sessions are services which are not provided by Lifeguard-Pro. Rather, the Lifeguard-Pro In-Person Training Sessions are provided by Lifeguard-Pro certified Instructors acting as independent, third-party, authorized service providers. 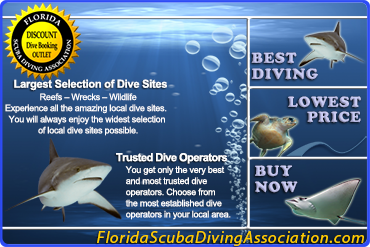 Consequently, the customer agrees that the customer will legally hold harmless Lifeguard-Pro, its employees, owners, operators, shareholders, or agents for any and all acts, errors, omissions, and/or representations of the In-Person Training Instructor before, during or after the In-Person Training Instructor provides the purchased In-Person Training Session to the customer. Delivery. The Lifeguard-Pro In-Person Training Session includes a ONE-DAY in-person training session provided at the location, date and time reserved in writing by the customer and approved in writing by Lifeguard-Pro and/or the In-Person Training Instructor. The In-Person Training Session is deemed to be fully delivered, when the In-Person Training Instructor arrives at the reserved location on the reserved date and time, and the In-Person Training Instructor conducts the ONE-DAY In-Person Training that the customer purchased. It is the customer's sole responsibility to ensure that all of the customer's Lifeguard-Pro certification course candidates participate in the purchased ONE-DAY In-Person Training Session. If one or more of the customer's Lifeguard-Pro certification candidate's fail to participate in the purcahsed ONE-DAY In-Person Training Session at the reserved location on the reserved date and time, neither the customer nor the candidate(s) are entitled to any refund or rescheduled In-Person Training Session. The customer and/or candidate(s) that failed to attend the purchased ONE-DAY In-Person Training Session at the reserved location on the reserved date and time may request the In-Person Training Instructor to conduct an additional ONE-DAY In-Person Training Session for an additional fee to which the customer and/or candidate(s), and the In-Person Training Instructor agree. Irrevocable Sale. Because there are travel, administrative, and other costs associated with an In-Person Training Instructor traveling to the customer's reserved location on the reserved date and time, and conducting the purchased ONE-DAY In-Person Training Session, neither a customer nor candidate(s) are entitled to any refund nor rescheduling of the In-Person Training Session. Possible Refund Exceptions. We realize that exceptional circumstance can take place with regard to the character of the service purchased. Therefore, we will consider granting refunds in the following instances. 72-Hour Cancellation Notice. The customer and/or candidate(s) notified Lifeguard-Pro and/or the In-Person Training Instructor in writing at least 72-hours in advance of their reserved In-Person Training Session that the customer and/or candidate(s) were cancelling the reserved In-Person Training Session in its entirety. In this case, the customer or candidate(s) are entitled to a full refund of all In-Person Training fees. The customer nor candidate(s) will be entitled to any refund for their purchased Lifeguard-Pro Home-Study Course(s). The customer and/or candidate(s) will be entitled to renegotiate a new purchase of a new In-Person Training Session. However, the same price and benefits of the cancelled In-Person Training Session might not apply to any new or rescheduled In-Person Training Session. Instructor Did Not Provide Training. The In-Person Training Instructor was unable or unwilling to provide the purchased In-Person Training Session to the customer and/or candidate(s) on the reserved date. RELEASE OF LIABILITY. The buyer, student, the student’s heirs, and legal designees agree to hold harmless Lifeguard-Pro, its owners, employees, agents, contractors, and instructors from any and all acts, errors, and omissions committed by the student while serving as a certified Lifeguard, Water Safety Instructor, CPR cardholder, First Aid cardholder, or cardholder of any other Lifeguard-Pro certification. You understand that completion of this certification course does not guarantee employment with any employer. Employers may re-test prospective Lifeguard employees to whatever standard the employer deems necessary for employment or require Lifeguard employees to possess advanced training or certifications from only specific organizations or individuals. An employer’s refusal to hire the student as a Lifeguard or the student’s failure to secure employment as a Lifeguard will not entitle the student to any refund of the Lifeguard-Pro course tuition. 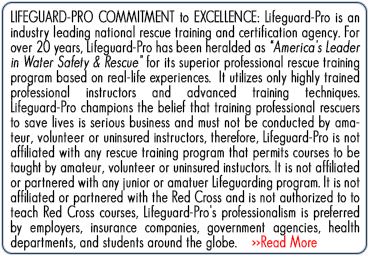 Lifeguard-Pro does not guarantee certification acceptance in any jurisdiction or employment by any employer. 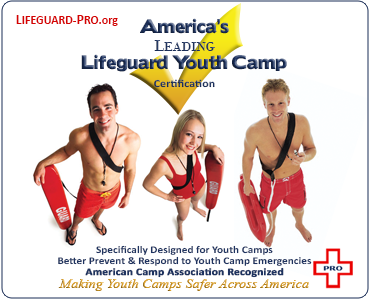 Lifeguard-Pro certification does not indicate Lifeguard-Pro’s endorsement of the cardholder (student). Rather, it only signifies that the cardholder (student) has successfully completed the Lifeguard-Pro certification course. Throughout the entire duration of the Lifeguard-Pro certification you are purchasing, the cardholder/certificant must: (1) Continuously improve, maintain and hone his/her certification course knowledge and skills; (2) Conduct himself/herself responsibly and professionally at all times while using this Lifeguard-Pro certification for employment or any other purpose; (3) Learn, obey and enforce all applicable laws, regulations, and rules governing the safe operation of any aquatic facility where he/she will use his/her Lifeguard-Pro certification for employment or other purpose; (4) Immediately cease any employment and immediately obtain the appropriate knowledge and training, if he/she becomes aware that he/she is not adequately prepared to properly respond to all foreseeable emergencies at his/her workplace; (5) Not commence using his/her Lifeguard-Pro certification for employment or other purpose, until he/she has participated in a thorough employer-lead orientation, and a comprehensive employer conducted review of all his/her Lifeguard-Pro certification knowledge and skills, which shall include, but not be limited to, facility orientation, review of all Lifeguard-Pro certification skills and knowledge, practice of emergency response procedures, practice with available emergency response equipment, and emergency response practice with fellow employees and/or staff; (6) Rehearse his/her Lifeguard-Pro certification course knowledge and skills for no less than 4.0 hours of on-site in-service training per month at his/her place of employment where he/she is using his/her Lifeguard-Pro certification as a condition of your employment or service; and, (7) On a monthly basis, review, refresh and practice all skills and knowledge contained in his/her Lifeguard-Pro certification course (including, but not limited to, course textbooks, course exams, course videos, course notes, and course physical skills). During the period that his/her Lifeguard-Pro certification is valid, if Lifeguard-Pro receives credible information that he/she has not conducted himself/herself in accordance with the conditions set forth in this paragraph, Lifeguard-Pro may immediately suspend or terminate his/her Lifeguard-Pro certification, without granting him/her a refund or the right to appeal the suspension or revocation of his/her certification. If you have any questions or concerns regarding our products and/or services, you should contact us prior to purchasing any of our products and/or services.